We would like to thank everyone for their kind wishes of goodwill and continuing support, against this criminal act which remains unresolved by Google/YouTube; who continue to deny us access to our main account on YouTube. I am ashamed that Google/YouTube would allow such an obvious theft of an artist's work. I have been watching Paul's videos for the past year and was shocked to discover their removal from YouTube. If common sense doesn't prevail in this situation, then Google's legal team needs to re-write their guidelines for copyright so that other artists can share their talents without fear of thievery. Really! Someone in TURKEY can claim a Scotsman's art videos?!! You make a very good point Susan - as things stand at this moment in time Google/YouTube's copyright m.o. actively discriminates against the legal copyright owner and as a consequence protects the criminals/criminal gangs. Furthermore, in allowing channels to exist on which material is illegally re-uploaded they are earning from the criminals ill-gotten gains. One of the channels that was illegally uploading our videos continues to exist and has not been removed by Google/YouTube. It is not simply that we cannot ever again trust Google/YouTube - it is what this means for other original content creators and how this continues to impact on those who may not be aware of this continuing trend. 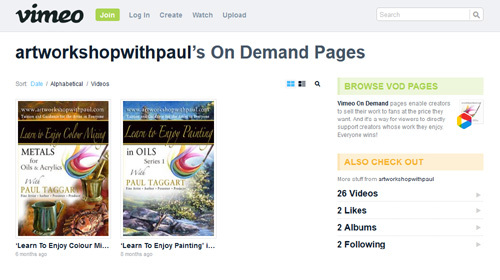 We have had to completely rework our entire set of plans for on-line tutoring. Meanwhile the matter is in the hands of the appropriate authorities who handle cyber-crimes of this ilk and some steps have already been taken. PS - thankyou for your kindest of messages, which we have replied to separately and we have sent you our latest newsletter which tells of the extraordinary support we continue to receive as we start our new journey on Vimeo. Hi Paul and Eileen sorry to hear about all that's been going on. Hi Seamus - how very kind of you to take the time and trouble to pop into our website to post your support and, please believe us, is truly appreciated and of much value in sustaining our belief in human nature. We guess you have received our latest newsletter because you mention our rent/buy videos. 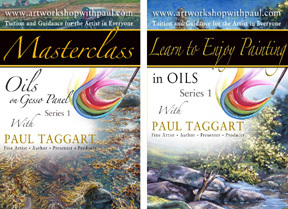 So presumably you know that we have created a boxed-set of oil painting videos, 'Learn to Enjoy Painting in Oils [Series 1]' and 'Masterclass in Oils'. We have just released the first or our newest idea of new films for 'Learn to Enjoy Painting [Series 2]' which will include a build-up course in oils. Please let us know if there is anything we can help you with. Paul, please keep up the good work. Paul Taggart is brilliant, I have seen many artists on youtube and Paul is miles ahead of any artist. Youtube have really made a mess of the relationship that was between Paul and Youtube - shame on youtube. Paul, please keep up the good work. I am truly an avid fan. Peter from Australia. Sadly the relationship between us and Google/YouTube is permanently mired in a 'mess'. But life has to go on and we have been rather busy over the past few months on getting the repairs in motion. Hopefully you received our latest newsletter in which we express our deep gratitude to everyone for the amazing goodwill that has been extended to us - we had absolutely no idea there was so much support out there for our work. Thankyou, thankyou for your thoughtfulness in getting in touch here on our website. 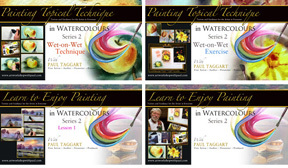 PS Currently we have eight boxed-sets on our Vimeo site and have just launched a new idea for regular build-up courses which feature Painting Topical Techniques, Problem Solvers, Exercises and a Start-to-Finish Painting - the first for watercolours; with more to follow for oils, acrylics and soft pastels. If there is anything we can do to help you, please let us know. Has the world gone mad! has the world gone mad! i as a fellow artist have hugely enjoyed your tutorials. nothing compares with them on the web.here's strngth to your brush! Oh Eric - you did have us giggling here - especially as we have found ourselves asking this very question since the first day of our criminal cyber attack. Whenever we are asked about our experience, the question is usually framed in much the same character. The situation defies any logic - but there you go, that's what happens when a behemoth is of the belief that it is untouchable. Thankyou for your kind message - it has added more strength to our brush and 'elbow'. Please considere any help, from my side. 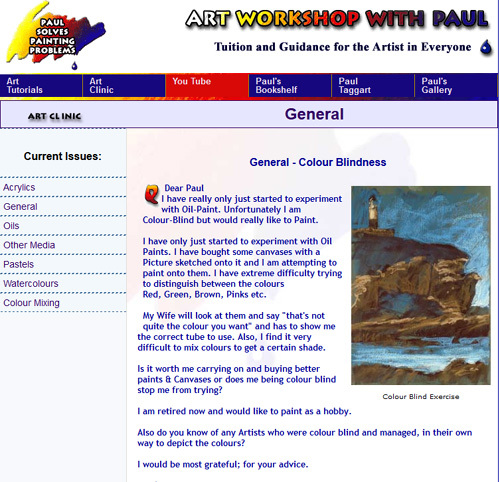 I considere an absolute lack of honorability from youtube and Google, because Paul has been, during years painting and teaching through magnifique tutorials I could see in Youtube. I was suscriber of Paul's account. Please considere any help, from my side. And many thanks for your efforts. Greetings Juan and many thanks for taking the time and trouble to come into our site to post your supportive message. We are truly grateful for the kindness you have shown and hope we can continue to be of help. We do hope you have received our latest newsletter about how we have started again and are filming new tutorials. 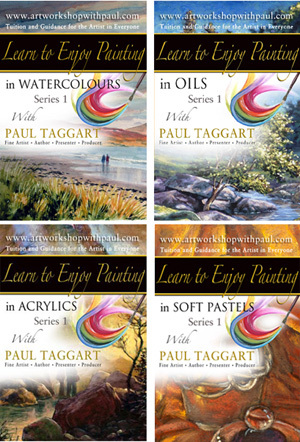 We have received requests for oils and Masterclass, soft pastels and acrylics - so these have been done. Now we are starting on some new tutorials, with new filming. But as we have also received requests for Watercolours Pencils and Colour Mixing, we will be doing those too. I was stunned to learn of your treatment by youtube,The only reason I visit that site is for learning opportunities provided by wonderul,generous people like you.This is appalling in every aspect.I wish you all the best in your courageous battle and thank you for all the time and effort you have given to share your love and knowledge of art. I am grateful to have learned from you. How kind of you Patrizia to seek out our website to post your caring comment - much appreciated, believe us. Sadly, this appalling state of affairs is unique to Google/YouTube - which leaves us vulnerable to further cyber crime attack. Moving positively forward has been made all the smoother by the tremendous goodwill shown us by so many from around the world. Although I am sorry to see that YouTubes behaviour was total pants in a small way I am pleased about it as I think together we have forged a better relationship with each other and hopefully it will just carry on from strength to strength , well done to you both..
How very kind of you Steve - firstly for taking the time and trouble to post your thoughts and secondly, for such lovely thoughts. We are working on our new beginnings and do appreciate the support received. Obviously someone, or a group out there decided we are no longer to have your free lessons. Paul, I can not believe what has happened to you, and all for the sake of money I would think. You have been so kind to allow us to have these lessons without having to pay. I only found your UTube site this year, and I was really enjoying your method of teaching. Obviously someone, or a group out there decided we are no longer to have your free lessons. I do hope that you are able to resolve this problem in your favour. I really feel for you both. Welcome Pam and thank you for making contact. Resolving this problem is not likely to happen anytime soon as Google/YouTube have not removed the illegal copyright infringement notices served against us for our wholly-owned videos – so it is with regret that we cannot do anything about our free-to-view tutorials. Meanwhile, we are working up new plans for our on-line tutorials and have continued to produce boxed-sets for our Vimeo PRO account where we are gradually building an index of Video on Demand downloadable videos for purchase or rent. It would be nice if there was another venue where you could post your videos. You are one of the few artists worth watching who convey classical techniques and can explain what is happening. I miss your videos on You Tube. Probably the only way to get their attention is to bring suit against You Tube, but that is probably futile as they will hang you up in court for ever. It would be nice if there was another venue where you could post your videos. Is your own website impractical for this purpose? I wish you well and hope this can be resolved as I really enjoy learning from your videos. THANKS, Gary V.
Greetings Gary and thankyou for taking the time and trouble to comment on the on-going criminal activities we have experienced via Google/YouTube. We share your frustrations, but as you have quite succinctly put it, we could find ourselves hung up on court proceedings for years if we were not careful in our handling of the situation. As you will know, we have resolved to continue for the time-being on the work that we had started in response to requests for DVDs to purchase - our solution to keep these costs down for viewers being to go down the downloadable route for purchase or rent - via our Video on Demand account in Vimeo. Your kindness in wishing us well is much appreciated. Many thanks for all the great teachine videos. Hello David and thank you for taking the time and trouble to watch our videos and post your throughtful comment. Sadly it doesn't look as if Google/YouTube will be sorting this out anytime soon; they have merely answered our letters with an anonymous/automated response - which effectively upholds the illegal copyright infringement notices served against our wholly-owned videos. Meanwhile, we are making alternative plans - and are continuing to prepare boxed-sets of our videos in response to demand for downloadable videos (which came in long before this debacle) and even more demand from folk since this situation kicked off at the end of June. Currently we have uploaded three boxed-sets to our Vimeo PRO channel and are in the process of making a Soft Pastels Series 1. YouTube is disgraceful, acting like the megacorporation it is - such actions in a real person would be punishable by jail time and the label sociopath. Well Stefan - your observation is spot on. Although we are realistic enough to understand that in Google/YouTube's 'megacorporate' world, we are but mere mall fry - nay even smaller than that, little midges - we had hoped for something better than the responses received to our legally-binding letter sent to four of the most senior executives in Google and YouTube. What our letter and subsequent responses have proved is that Google/YouTube believe they are above the law. Rather than remove the offending and illegal Copyright Infringement Notices raised again six of our wholly-owned videos, thereby restoring our channel to its original state (which was required of them in our letter) - we received an automated/anonymous email in response to our letter to Google's Chief Legal Officer and another of the identical email in response to the copy of our letter that we sent to the Senior Vice President of YouTube. This email started as follows:- "YouTube removes content when we receive complete and valid removal requests." - given that these were not valid removal requests; it proves completely that they do not care one jot for the legal ownership. Thus we find ourselves with a damaged channel and Paul is obstensibly a 'copyright thief'; for as long as Google/YouTube uphold those illegal Copyright Infringement Notices and have deleted our six videos, then that is what he is considered to be by YouTube. We hold Google/YouTube totally responsible for providing 'safe harbour' for these criminals and malicious trolls and for putting in place a flawed copyright system; one that is unique to them. Thank you for your continued support and interest - we do appreciate it. 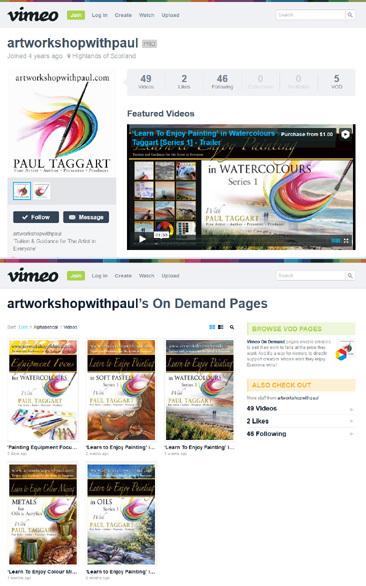 PS Meanwhile we are doing some special Problem Solver videos which are free-to-view exclusively to our Art Workshop With Paul Taggart Painting Companions group in FaceBook - a 'closed' group - which you are welcome to join if you feel able. Thankyou so much for taking the time and trouble to come onto our website and leave a comment in our YouTube section – we really do appreciate your thoughtfulness and heart-warming message. You could so easily have ignored our on-going efforts to resolve this matter. Because of all the ‘games’ being played with our videos and channel by not only the criminal/s, but also by Google/YouTube (whom we hold totally responsible for their unique and lax system that discriminates the wholly original content creator in favour of the fraudulent/malicious criminal/s) we felt we had no option but to make the series of three explanatory videos; which you have viewed on our main website. Sad-to-say our difficulties are not going to be resolved anytime soon – Google/YouTube are steadfastly ignoring our requirements that they acknowledge our total ownership of the videos and channels and return them to the state they were in before this cyber-crime kicked off. As this is going to be a long-running saga, we are having to rethink our plans for online tutoring and the way forward. You would think that Google/YouTube would have a system for embedding a digital code with original material uploaded by Partners who have been ‘verified’ – seems the natural way to do things. But that would involve additional costs, as does policing YouTube – so Google/YouTube have opted for the least expensive way of handling Copyright; without seeming to be ignoring their responsibilities. As this is going to be a long-running saga, we are having to rethink our plans for online tutoring and the way forward; all of which will take a little time and additional resources – although some may think we are ‘dead in the water’ we are far from being so. We are quite happy to put together boxed-sets for requests; so please don’t hesitate to ask (no obligation, by the way). It is completely wrong and unfair. Welcome Jill and thankyou so much for your warm support and lovely message - which is much appreciated. Google/YouTube have shown absolutely no interest in our situation and as such, we cannot possibly trust them to protect our work. So, as you will read in our replies to others who have shown their support here, we are re-evaluating our way forward for on-line tutorials. The hard work we had put into building up a free-to-view channel on YouTube have been wiped out, by not only the criminal/s; but more disturbingly by Google/YouTube. We will keep in touch to let you know what our plans are as they unfold. I want Paul Taggart back! I want Paul Taggart back! What is your problem? You are thieves, liars and cheats, you have taken Capitalism too far, some day you will answer for all the evil you have done! The Sister said you were Wicked, and I agree! Hey Sandra - how about joining us in our wonderful group in Facebook - there you will find supportive, encouraging, inspiring and like-minded people from around the world who share a passion for creativity. No Google/YouTube to wreck our enjoyment of art. Use the link on our Home Page and when you arrive at any of our FB pages, or Paul's profile, drop us a comment and we will send you an invite to join us - for security and privacy reasons, this is a 'closed' group. 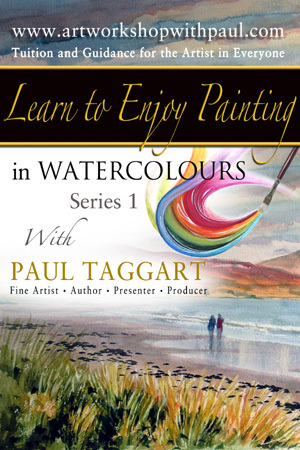 Hope to see you there - we are doing some free-to-view Problem Solvers exclusively for Art Workshop With Paul Taggart Painting Companions. All best and thank you so so much for your continued interest and support. It is unfortunate that these thoughtless few - have to ruin the enjoyment that the rest of us so appreciate in the videos that you painstakingly provide. It is imperative that utube developes better policies and procedures to protect the intillectual property of those that legitamently upload videos rather than penalizing and freezing channels. I do hope that u receive a favorable response from utube. Deterring those that pirate videos should be the goal here...as this is likely to get worse before it gets better...best of luck....keep us posted. Thank you. Thankyou so much Lin for taking the time and trouble to seek us out and for posting your comment on our website - we really do appreciate your thoughtfulness. Sadly we are not getting very far with Google/YouTube thus far, in spite of our 'legal' letter to four of the most senior executives in Google and YouTube. Notwithstanding the fact that we have reported the multi-layered criminal acts that have been perpetrated against us to the relevant Fraud/Cyber Crime Investigation Bureau. You hit the nail on the head in all of your observations and statements. 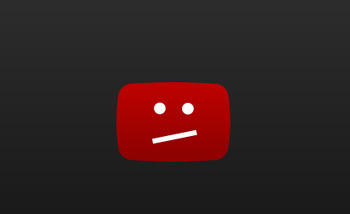 So far Google/YouTube have re-instated three of our nine illegally contested videos (although they are once again vulnerable to attack); retained two that had been illegally downloaded and re-uploaded and our channel is still 'blacklisted' and inaccessible to us. That, coupled with absolutely no sign of protection for any creative uploading wholly original content makes it an impossible situation for the likes of us. So we remain vulnerable to the criminals. So sorry about your troubles. So sorry about your troubles. It sounds like utube has a totally unrealistic and unfair policy regarding your problems. I hope they get smarter in the future. Could you not use the above to replace youtube? 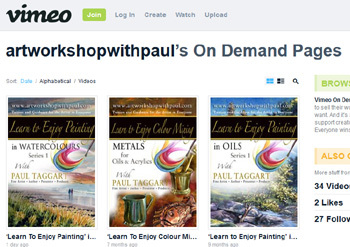 Paul -you had an old site on http://blip.tv/artworkshopwithpaul/learn-to-enjoy-painting-portraits-and-figures-with-paul-taggart-figure-study-workshop-6210687 Could you not use the above to replace youtube? Another case where you are guilty before being proved innocent.